Bittersweet Endings, Brooding Hero, Charming Hero, Fantastic Read, Favorites, HarperCollins Publishers, Paranormal, Red Hot Reads, Review, Toe Curler!! I am not much of a fan of reading books of a series, mostly because the happily ever after that I am looking for doesn’t come about until the very last book has been published. Nevertheless apart from Twilight which I attempted reading a couple of days back and stopped, this is the first series that I am ever attempting to read and am determined to complete reading. 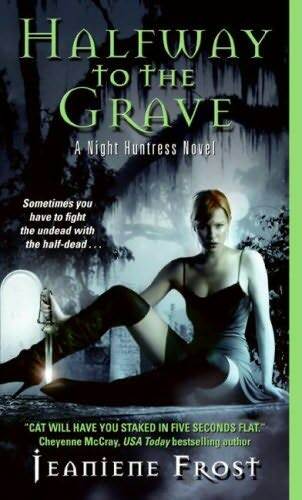 The night huntress series is an urban fantasy romance featuring half-vampire Cat Crawfield whose the heroine featured together with Bones, a two hundred year old vampire whose a bounty hunter of his kind. Cat never knew that she was half-vampire or the fact that her mother bore her after getting raped by a vampire until she turns sixteen. Though Cat has always known she is different from the rest of her peers, its only when her mother explains about the “evil” that resides within her that Cat comes to realize what she truly is. Her mother’s hatred for the vampire species has Cat out hunting for those who prey on humans for feeding and killing them without any compunction because Cat feels that she owes her mother for what she went through. It is during one of these hunting sessions that Cat comes across Bones. The scene where Cat first meets Bones is one that would always be etched on my mind because of the hilarity of the moment. Before Cat knows it, she is captured and being interrogated by the fearsome vampire who moves as fast as lightning. A deal is struck between the two though Cat doesn’t trust the magnificent vampire who stands in front of her and raises her hackles so effortlessly. Bones promises that he would help Cat find his father in return for her services in hunting down and killing rogue vampires. Bones trains Cat to be more efficient and to make the best use of her skills and assets which makes her a deadly opponent. However the hunt for a deadly vampire who has powerful friends in high places within the government becomes a deadly race against time when Cat’s family is threatened. The sexual tension between Bones and Cat is sizzling hot and I found myself craving for a Bones for myself. Although this story is told in the heroine’s perspective in the first person, it doesn’t hinder any part of the novel, in fact it just made things more interesting if I may say so. But the ending is not a happy one with Cat and Bones going their separate ways, and I am thankful for the fact I won’t have to wait eons for the next book in the series to come out. Four books of the series have been published with the fifth one to come out on the 22nd of February next year with a total of seven books in the series as denoted on the author’s website. I just have got to say, I am loving Bones and I don’t think I will ever get enough of him. I hope that the other books in the series continue with the same sizzling heat and adventure that would keep the pages turning. My favorite line from the book would have to be when Bones says to Cat “If you run from me, I’ll chase you, And I’ll find you”. Sigh!! And you just gotta love his British accent, the way he calls Cat “Kitten” and the way he calls Cat “luv”. Drools!! I know!! The second book proves to be engrossing as well!